The candidature of these candidates is provisional. In accordance with the Rules of the Examination, all these candidates have to apply again in the Detailed Application Form, DAF (CSM), for Civil Services (Main) Examination, 2014, which would be available on the website of the Union Public Service Commission www.upsc.gov.in. All the qualified candidates are advised to fill up the DAF (CSM) online and submit the same ONLINE for admission to the Civil Services (Main) Examination, 2014 to be held from Sunday, the 14th December, 2014. The DAF (CSM) will be available on the website of the Commission from Tuesday, October 28, 2014 till Tuesday, November 11 2014. Important instructions for filling up of the DAF (CSM) and for submitting the completely filled application form ONLINE, to the Commission, would also be available on the website. The candidates who have been declared successful have to first get themselves registered on the relevant page of the website before filling up the ONLINE Detailed Application Form. The qualified candidates are further advised to refer to the Rules of the Civil Services Examination, 2014 published in the Gazette of India (Extraordinary) of Department of Personnel and Training Notification dated 31.05.2014, which is also available on the Website of the Commission. All the qualified candidates are also required to take a print out of the finally submitted DAF (CSM) separately after submitting the duly filled DAF (CSM) ONLINE. The successful candidates will have to send the printed copy of the DAF (CSM) duly signed by the candidates along with all relevant documents including the prescribed fees, wherever applicable, as enclosures addressed to the Under Secretary [CS(M)], Union Public Service Commission, Dholpur House, Shahjahan Road, New Delhi-110069, so as to reach the Commission's Office latest by Tuesday, November 18, 2014, 5:00 P.M. The envelope containing the print out of the DAF(CSM) that was submitted ONLINE by the successful candidate should be superscribed “Application for Civil Services (Main) Examination, 2014”. It can also be delivered at the Union Public Service Commission counter by hand till by Tuesday, November 18, 2014, 5:00 P.M. It may be noted that mere submission of application form DAF(CSM), either online or the printout copy thereof, does not, ipso facto, confer upon the candidates any right for admission to the Main Examination. The admission certificate along with the time table of the Main Examination will be uploaded on the Commission’s Website to the eligible candidates around 2 weeks before the commencement of the examination. Changes, if any, in the postal address after submission of the DAF (CSM) may be communicated to the Commission at once. Candidates are also informed that marks, cut off marks and answer keys of Civil Services (Preliminary) Examination 2014 will be provided only after the entire process of the Civil Services Examination, 2014, is over i.e. after the declaration of final result. Therefore, No application under RTI Act, 2005 or otherwise will be entertained in this regard. The Union Public Service Commission have a Facilitation Counter near the Examination Hall Building in its Campus at Dholpur House, Shahjahan Road, New Delhi. Candidates may obtain any information/clarification regarding their result of the above mentioned examination on all working days between 10.00 AM to 5.00 PM, in person or on Tel. No. 011-23385271, 011-23098543 or 011-23381125 from this Facilitation Counter. 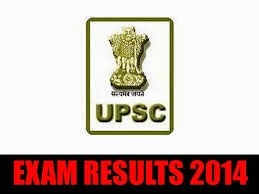 Candidates can also obtain information regarding their result by accessing Union Public Service Commission Website www.upsc.gov.in . The results of Roll Numbers 407292 , 990000 , 990001 , 990002 , 990003 , 990004 , 990005 , 990006 , 990007 and 990008 have been withheld on the directions of Hon’ble Central Administrative Tribunal Principal Bench at New Delhi . The Commission have also decided to withhold the result of the roll number 051913.